This type of evidence reporting may be disturbing to some, not because of the evidence itself so much as because of its implications. After all, this evidence isn't on what we consider to be some distant remote planet like Mars but on the Moon close to us hanging right over our heads every night. A place that we consider as ours and to be dead and without active current life. If you have strong feelings in this regard, perhaps you should consider not getting into this report and its evidence because this may burst a bubble. 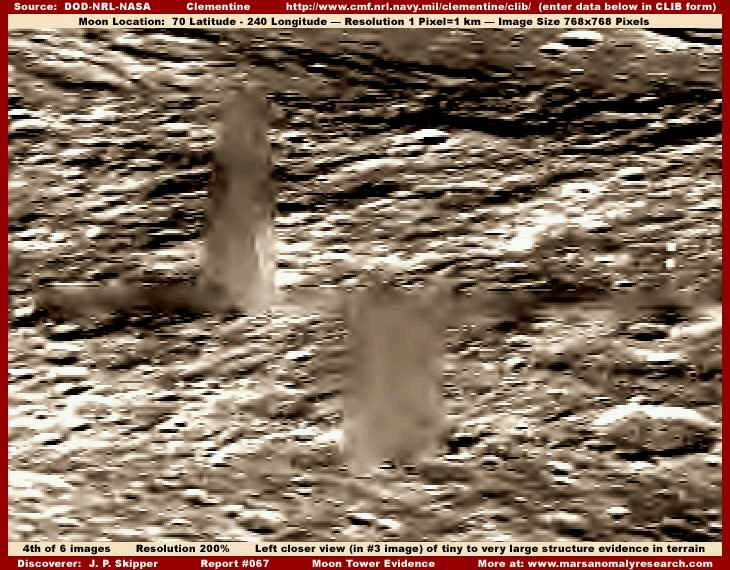 With that said, the above first image, as are all the rest here, is taken directly from the 1994 Navy Clementine military official science data and shown above at standard official resolution demonstrating two massive left and right towering objects in the terrain. Although blur and smudge tampering applications have completely covered up these objects so that no specific details of their true structure can actually be directly seen, that doesn't mean that there isn't plenty here to interpret and learn from. We are fortunate that the 1994 tampering applications stage of development mapped and tightly conformed to each of these huge object's individual shape in a different digital layer rather than more effectively blending that shape out against and into the background terrain in a single layer as is more typical of the later MGS MOC imaging. The net effect of this is that we can still tell that these are most likely massive very tall vertical towering structures that dwarf by far anything else in the terrain around it. The objects wider base footprint tapering to a narrower form as it goes up to the more slender top is typical of a very tall skyscraper building forms here on Earth. However, these on the Moon are much more massive and far taller than anything here on Earth, no doubt enabled by the Moon's much lower gravity. Now note right off that these objects do not cast a shadow and that might at first impression lead one to consider that this may be a tapering shaped strip of blur/smudge tampering horizontally oriented on the ground and not covering a tall vertical object. However, the terrain all around these towers where a shadow might be have been has been subjected to smudge color coordinated object specific image tampering applications done at much closer resolutions than officially released. As I have stated a number of times, the mapping type tampering applications map around normal size evidence at much closer resolutions never released to the public and then the distancing technique added produces the tiny looking geometric rectangular structures you will see here that this terrain is absolutely full of around and nearby these immense structures. The mapping to individual objects process leaves out the light reflective tops of normal size rectangular structures and creates the many rectangular tiny specks you see in this terrain at the official resolution that is released to the public. If you will look very close, take special note of these prominent specks in the terrain to the immediate left of the base of the left tower and note that they are for the most part rectangular shaped. These tampering applications in the terrain have also in the process broken up and covered up the shadows of these towers along with just about everything else natural or artificial in the surface topography except for the reflective tops of rectangular structures. With long straight linear lines at the edges, the dark very long shadows that would be expected to be thrown by these objects would fall well within the automated software's geometric programming profiles and be candidates for cover up applications. When this close resolution stage of the tampering work is done, the imaging is then drawn back to a more distant view leaving the software having only to map to the tower objects in a separate digital layer. The color coordinated (with the terrain) blur/smudge tampering is applied to the towers. Once these largest of all structures are covered up, then the view is again drawn back to an even more distant and final level providing the official view seen above as released to the public. This much distancing away from the true much closer image resolution reduces anything normal size to something very distant and tiny as you see here at official resolution where original shapes tend to merge together forming new false shapes. This distancing tampering technique works well with normal size now reduced to very tiny size evidence but, even heavily covered up by blur/smudge tampering, the massive towers dominating the terrain are still far too large, still too prominent, and still too noticeable. So they then cause the imaging to be generally substantially out of focus and it is also darkened a bit. If questioned on this particular obfuscation technique, you can bet that their misdirection defense would no doubt be to point out that this is albedo tuned Clementine Moon imaging designed to capture color reflectivity and differentiation and not designed to enhanced ground based object sharpness and detail. Of course such a explanation would ignore the fact that some simple enhancements by me are able to RETURN the image to a level of resolution closer to its original sharpness just as you see here in my imaging and thereby substantially improve the view. Obviously, if the original sharpness wasn't there in the image to start with, I could not have done this. That fact demonstrates that the original sharpness of the image has been degraded. That is unless you accept that the best military imaging specialists in the world able to count the warts on a bald headed terrorist's noggin from a distant satellite view (okay a slight exaggeration) are consistently incompetent in image after image in the tens of thousands of the Clementine Moon. The combination of all these different types of image tampering effectively leaves even the immense towers vague appearing and harder to see and differentiate from the terrain they sit in. Yelp, you guessed it, that describes the resolution situation of the Clementine official data as released to the public and for research. So, if you are inclined to look at the official imaging for yourself to check behind me and verify the evidence and its details as appears in my imaging here, remember that I have done clarifying work to defeat some of these obfuscation tactics. So be prepared to have some graphics software at hand and use it if you desire to bring this evidence out of the darkness and sharpen up its official fuzzy quality to match the clarity of my images here. 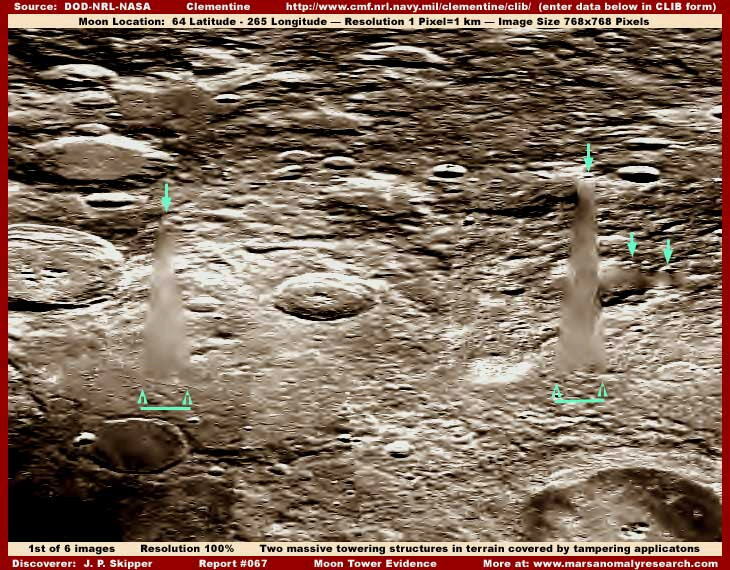 As evidence of these tampering applications destroying shadows, I draw your attention to the small crater and its interior shadow to the immediate right of the top of the right tower and then note the small crater a little further to the left even with the top of the right tower in the above first image. 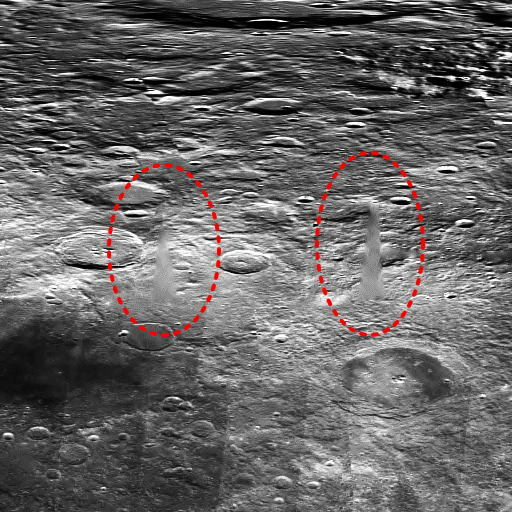 If real and not themselves tampered with (possible), these two small craters demonstrate the sun angle and the position of legitimate interior shadows on the crater floors. Now look around at the other craters and you will seen that in varying degrees they do not demonstrate this sharp shadow effect, even though they as craters theoretically should. That's because they are generally larger, have broader surface interiors apparently providing more room for development of content in them needing obfuscation administrations and therefore have been the recipient of a lot of tampering smudge applications. This out right destroys or at the very least compromises the visuals of shadows cast on the near side interior by the raised crater rims along with the rim and everything else, including any artificiality or natural geological topography evidence. I could have shown these tampering applications better here by darkening the scene and zooming in more but this would have come at the expense of clarity on the towers main evidence and I ran out of image room in this report for any additional imaging. In fact, all the images in this report are seeing a lot of ground level detail typical of tampering masked civilization evidence making each image file size larger than normal and six of them are pushing the envelope and have bogged down this report's loading speed considerably. I am sorry about that but it couldn't be helped. The above second image offers a split screen view showing the two towers much closer or rather the blur/smudge tampering covering them. At the very minimum, the mere presence of this blur treatment covering something this large and massive on the Moon's surface should be a real eye opener for even the most hardened skeptic. 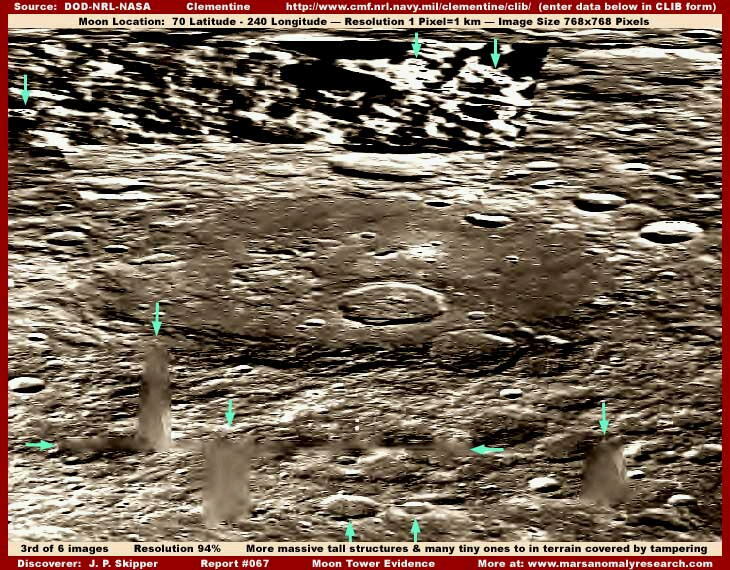 Even if you can't accept my take of what this evidence logically appears to be, you have to ask yourself, what could there possibly be about the supposedly airless no gravity dead lonely Moon's geological surface that could warrant these highly object specific very clear image tampering treatments on such a scale??? Make no mistake about it, you are looking directly at evidence of censorship and by the military, not just the usual manipulations of NASA/JPL and company. The military is in absolute control of the Clementine Moon mission from beginning to end and you can bet that what ever is under this tampering is as top secret as it gets in our society. To clarify in your mind just how much in control of this particular Clementine mission the military is from the DOD (Department of Defense) on down, reread my previous report #066 titled "The Clandestine Moon: An Overview" for some enlightenment. However, as obvious and highly dramatic as this massive very tall structures evidence is, it is not the only important evidence here. Now these scenes have been over lightened a bit from the darker originals to give you the best view of these immense tall objects but this came at the expense of the much smaller evidence detail and that's what I want you to consider now. In the above second image and in the left split screen frame, please look close and note the area in the terrain to the immediate left of the base of the left tower structure. The color coordinated smooth surface featureless smudge tampering application coatings there tightly hugging the terrain should be obvious to many of you. You can see how this both covers over almost everything but also leaves portions, particularly top portions (roofs) of some of the tiny rectangular structures out in the midst of the application. When drawn back to the official distant resolution as evidenced in my first image above, these just look like simple specks in clarity enhanced imaging. Likewise, when viewed in the official resolution with its fuzziness and darker quality, these are often not even visible even as tiny specks and only as a vague terrain texture that breaks up the smooth featurelessness of the applications. This is how what we would consider normal size civilization evidence is hidden. This is how tower shadows and crater interior shadows are visually compromised, broken up, and/or destroyed. This is how color coordination is mapped into the terrain on the back of this mapped coating done at many times closer resolutions than seen here. This is how the visuals of real natural geological surface details are compromised or destroyed substituting false illusionary detail. This also how visual frame of reference surface objects are compromised that might tip one off as to what the true distance/scale is as opposed to what we are being conned into believing exists in any view. Once you understand how these manipulations are done, then you begin to realize that the view is much more distant that you are led to believe by the official statistics and that these tiny rectangular structures are really what we would consider normal size objects, just seen very distantly via artificial manipulation. For example, one of those tiny rectangular objects you see in the midst of that tampering to the left of the base of the left tower is actually the size of a very large long multistory commercial building. Once you understand that and the real scale here in this scene, you begin to realize that the vertical artificial tower (assuming it is that) is actually incredibly massive, super tall, colossal in scale, and well beyond the size of any vertical structure seen here on Earth. 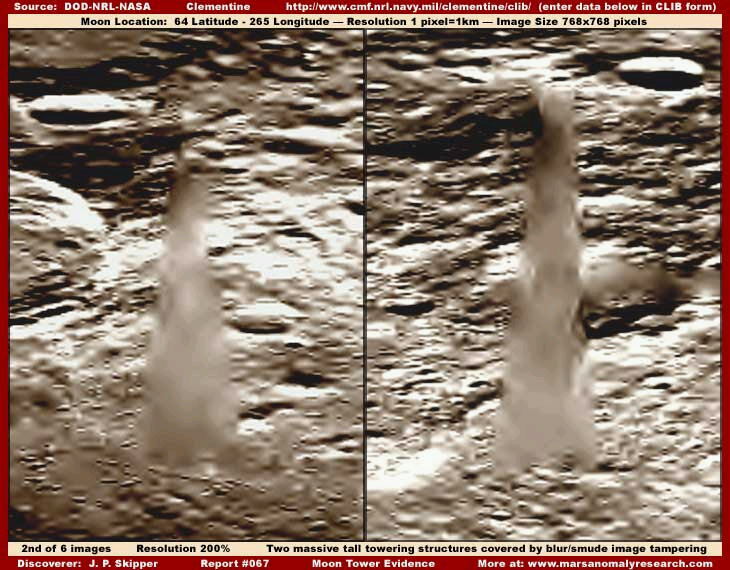 The above third image demonstrates yet more very obvious tower evidence but in a different location. This new and different site is actually nearby and to the right or east of the site of the two towers in my first and second images here. The massive structures in my first and second images are very similar to each other in their super tall tapered shape but here the left tower is very similar to the first two but the two towers to the right in this scene are a bit shorter, more blocky in appearance, and a bit more massive. The collection of green arrows point out some of the most obvious but not all of the civilization evidence in this scene. The tampering covered up massive structures are very obvious but also note the great number of rectangular tiny specks located all around in this scene. Many of these are tops of geometric structures sticking out of the smudge tampering applications but you will also see a good many tiny rectangular structures sitting in the landscape not covered up by the tampering. Scale wise this is what we might consider normal size civilization evidence, just seen very tiny because of the use of the distancing technique. It is this very telling smaller size evidence that provides us with insight into the true size scale here and gives us a more accurate perception of the colossal size of the dominating massive structures. Pay special attention to the large shallow appearing crater in the background landscape behind the towers. It is shallow appearing only because the mid and rear areas are covered up by heavy darker smudge image tampering applications that have obliterated the side and rear crater rims blending these areas into the general surrounding terrain and creating the illusion of not much depression depth. The near foreground rim in the dark narrow band area has also been broken up by tampering applications but, although thick, these applications are a little more spotty there and there is just so much small geometric structure evidence concentrated in this band and much of it can be seen better in the closer imaging in the next two images below. The above fourth image demonstrates a closer view of the scene in the left field of my third image. As you can see, the blur/smudge tampering covering up the largest most massive vertical structures is clear and very obvious standing out very sharply in the terrain. Note the long narrow horizontal band of tampering application extending out left and right from the base of the taller tower on the left and in the background behind the right tower hiding something lower profile and long in the terrain. Just as important, please note the few small but still clearly seen rectangular geometric structures evidence in the terrain out in the foreground in front of the left tower and to the left of the right tower that the direct tampering applications missed. Now look at the small geometric structure evidence thick in the dark area at the top of the image. Small but very telling evidence and it is all over this general scene. The above fifth image is a closer view of the right field of view in my third image. Note the obvious massive but lower profile (relative to the tallest towers) structure hidden by the blur/smudge tampering application near the right side of the image. It dominates everything but this scene is more important because it has some of the most and the best small structure evidence in it. Get close to the computer screen and look very close at the many geometric small structures in the darker area near the top of the image. Many have dark black narrow runs of tampering on them to break up their visuals and run them together but some individual geometric structures can still be clearly seen to, especially the reflective roof tops. This is very powerful artificiality evidence and right on the Moon hanging over our heads every night. Note to that this evidence significantly appears to be in the open and not under protective covers. However, this imaging does not allow a conclusive determination as to whether any of this artificiality evidence is active or long dead or abandoned. But, if you can accept any of this evidence at all and before some start choosing to believe that this must be dead or abandoned evidence, consider why there have been no human return visits to the Moon in over three decades since the initial flurry of the 1960s and 1970s? That clearly amounts to avoiding the Moon and instead concentrating on space stations closer to home in the intervening decades. Also, why the refusal to have Hubble close image the Moon? That to clearly amounts to avoidance as well. Why the determined resistance in spite of pressure from scientists in this regard? Think about it! 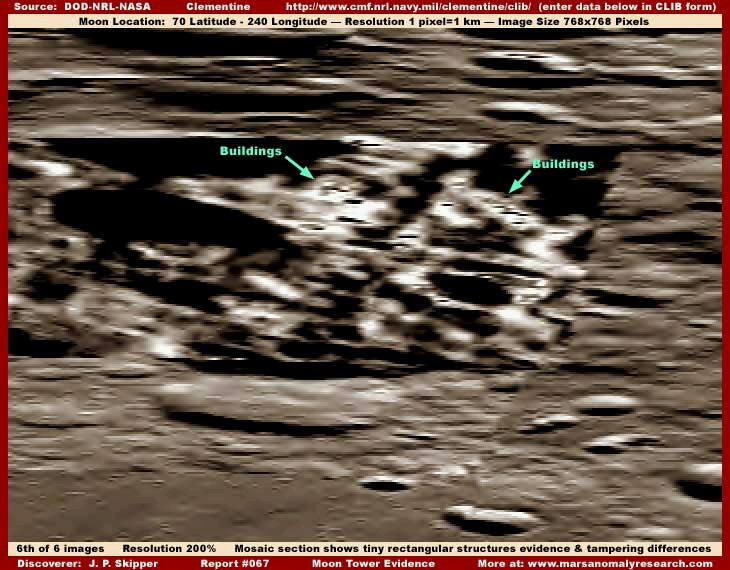 If there were long dead and/or abandoned sophisticated structures on the Moon on the large scale you see here, there would have been secrecy but also a mad scramble to access them and their knowledge potential as quickly as possible. That this appears not to have happened is significant evidence in its own right. 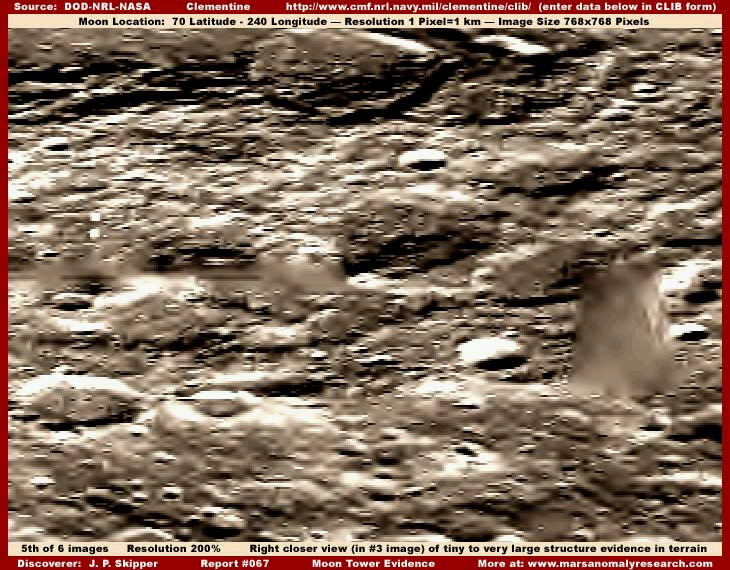 Likewise, some might want to suspect that we are already on the Moon and the mostly hidden civilization evidence seen here is only evidence of our being there and that is the secret being hidden. Well we might be there but I doubt it. Either way, the civilization evidence seen here is too much and far beyond what could have been accomplished in secret on the Moon by Earth humans in the last few decades. It clearly represents the presence, past and/or present, of someone else on "our" Moon. The most likely scenario is that early Moon exploration discovered something there that has caused us to keep our distance for decades and this is the secret that is being maintained. Why? Very likely because there is little to nothing we can do about it. This has no doubt had its impact on our exploration of Mars as well with a similar result. Non intrusive observation devises may be permitted but not anything more intrusive than that and that is why the only missions to the Moon and Mars since then have been in the form of lower profile fairly covert surveillance technology and why manned missions have been so determinedly resisted. Some skeptics in denial may want to talk about these many geometric forms being the result of over pixelation of the images. If so, all you have to do is look at the smoother featureless and a bit lumpy (conforming/mapping to what they cover up) tampering application surfaces and edges and note that you see absolutely no pixelation in these spots such as on the towers. Pixelation is the result of zooming in too much so that the underlying square pixel grid is blown up too much and starts introducing blocky patterns all over the image. If this was truly happening, then that blocky pattern influence would be demonstrated all over the image, not just in the parts of it demonstrating geometric structures. That this is not the case, is very telling. Further, anyone with graphics software can prove to themselves that pixelation is not a factor by simply increasingly zooming in on the original official image. When you reach the zoom factor matching what I have on the evidence (always stated), you will see no pixelation on the evidence. But, if you zoom further beyond that point, true pixelation blocky patterns will gradually begin to appear. The point is that pixelation happens only beyond the point of my zoom factors confirming that pixelation by me is not a factor in my imaging. The above sixth image demonstrates a mosaic image section clearly inserted into the overall image. The presence of this insert and its relation to the other evidence can be seen at the top of my third image here in this report. Note that, just as I pointed out in my older report #054 titled "Viking Tampering Evidence," the insert stands out so sharply in this terrain because the image tampering applications are different in this mosaic piece than the others surrounding it. The terrain outside the insert has a great deal of color coordinated tampering applications in it such as the more evident carpeting treatments in the large crater in the left bottom area of the above image that created the shallow crater illusion at the back of the crater. However, within the insert area there are a lot of very dark color tampering applications. The result is the strong contrast between the two different tampering fields drawing attention to the insert and its straight perimeter demarcation lines. Most of the small civilization evidence within the image insert area has been obliterated by the very dark tampering leaving only the smallest of all evidence out of it and that located in high albedo (reflective) areas which tends to obscure it. However, even though very small due to the distance tampering, the tiny evidence left out of the tampering, some of which is pointed out by the green arrows, still clearly appears to be lower profile rectangular geometric structure evidence strongly suggestive of artificiality and buildings. You should be aware that the official images the evidence in this report is drawn from are located in the upper northern latitudes near but not in the North Polar Region. The satellite/camera orbital path from south to north generally conforms to the curve of the Moon's surface over most of its passage but begins in its elliptical orbit to be further away from the surface as it approaches the poles. This starts occurring right at this mosaic image insert point and its camera shots of the surface at this point begin to be further away from the surface and more angled. This distancing and widening of the view taking in more of the curvature of the Moon away from the camera also tends to stretch the image. The Moon topography at and just above this insert's location starts to show this effect. Above this point, viewable detail very rapidly degrades and distorts with distance and this stretching effect. I suspect that some of you have strong fairly entrenched assumptions about what is acceptable to be considering as being on or not being on the Moon. After all, generations have grown up thinking of the Moon a certain way and that it is a dead airless place inhospitable to life as we know it and the only way human life as we know it could live there is in protected and even armored environments on the surface or underground. If thought about at all, this concept is so deeply entrenched in the public psychology and reinforced by a perception of familiarity with the Moon (warranted or not), that evidence such as you see here is probably going to be perceived by some as too fantastic and perhaps even too disturbing and therefore rejected emotionally as outright impossible. The fact that the smaller evidence that we can also see here appears to be out in the open and not protected by traditional barriers (that we can see or might be familiar with) appears to fly impossibly in the face of our belief systems and what we might think we should expect of the supposedly airless Moon, also tends to reinforce the concept that this evidence is impossible. Yet, the visual hard evidence presented here is implacably what it is. Further, it is readily verifiable in the official data by anyone who cares to go to the trouble of checking it behind me via the links provided below and supported by that data. Just remember, I do not in any way make this evidence, only present it as it is found, so don't blame the messenger if you see something here you don't like and find disturbing in its implications and possibilities. As you can see in the hard visual evidence here, it is clearly an inescapable fact that there are massively large objects or areas on the Moon's surface being intentionally visually hidden from our view by image tampering applications. Clearly someone here on Earth is doing this and definitely knows the truth! Beyond that identifying what is being hidden beneath the tampering is admittedly speculation but that speculation can also be based on logic and reason to and therefore still informative and worthy of exploring. Clearly, the military logically would not be hiding natural rock/sediment topography as that would simply not be worthy of such secrecy obfuscation treatments and can be ruled out. So what else is there? By the process of elimination, based on the question of what would be worthy of such treatments, the obvious implication is that these are artificial structures of some kind and therefore most probably represent civilization evidence. The small rectangular geometric evidence in the terrain around and nearby these massive objects that are not completely hidden by the image tampering applications also reinforces this concept. Additionally, the mere presence itself of the considerable image tampering mapping to and covering up most of this evidence also reinforces this concept. Obviously, where there is smoke, there is also of course probably fire. If someone else does have a long term entrenched presence on "our" Moon so close every night over our heads with all of its implications, including how they be interacting with us and who has a right to what, then this is our truth and reality whether we are willing to admit it or not or face it or not. Personal denial and pretense changes nothing at all and only perpetuates self ignorance and that in turn increases the risk of an unfortunate unprepared for outcome as reality goes on relentlessly about its business. We have to wake up to the real world that we already live in and learn to effectively deal with it if we are ever to be worthy of our own self respect and stand on equal footing with peers we didn't even know we had. At the very minimum, the crystal clear and undeniable tampering hard visual evidence seen here on such a large scale mapping to such sharply defined specific points of the Moon's surface topography tells us absolutely conclusively that there is a large secrecy agenda in existence within our space exploration programs, someone here is clearly involved, and it represents some kind of truth that is big and important enough to be actively hidden from the public and taxpayers who pay the freight that enables the very endeavors that produce this evidence and who own it. Maybe some of you will not agree but I think this situation is wrong, increasingly risky, and a situation requiring correction. If we need to grow up some in the process, then so be it. What do you think? Do you really want to know? Can you handle the truth I suspect many of you already sense and logically anticipate? Are you ready to move on psychologically into a new age of increased complexity that appears to possibly be already upon us? http://www.cmf.nrl.navy.mil/clementine/clib: This link accesses the Navy's official Clementine Lunar Browser 1.5 (CLIB) search engine form of the Moon based on coordinates to bring up the image site location my first and second images here are drawn from. On the form, click on 1 pixel = 1 kilometer. Below that in the image size in pixels click on 768x768. Below that enter 64 in the Latitude box and 265 in the Longitude box. Immediately below that click on the "Use Lat/Long" button to bring up the image properly sized. http://www.cmf.nrl.navy.mil/clementine/clib: This link, same as above, accesses the Navy official CLIB search engine form of the Moon Clementine science data based on coordinates to bring up the image site location my third through sixth images are drawn from. On the form, click on 1 pixel = 1 kilometer. Below that in the image size in pixels click on 768x768. Below that enter 70 in the Latitude box and 240 in the Longitude box. Immediately below that click on the "Use Lat/Long" button to bring up the image properly sized. NOTE: The official imaging as released is fuzzy and a bit dark. Although the colossal size evidence pointed out here can still be confirmed and verified in it, the better detail you see in my imaging here will require the use of graphics software to match it. Below is an image of the moon derived from data accumulated by the Clementine satellite. This interface allows you to view an image of the moon, centered on whatever point you indicate by clicking on the image below. In addition you may select from a variety of resolutions and image sizes. You may also retrieve a copy of the actual data returned by the satellite from which the multi-resolution images are derived by using the form in the bottom section of this page. More information and help are available for this interface. The Naval Research Laboratory is not affiliated in any way with any organization selling lunar property or acreage on the moon. NRL has no involvement, either officially or unofficially, in providing "after-sales service" for the purchase of lunar property from the Lunar Embassy, its franchisees, or any similar organizations. Disputes arising from the purchase of lunar property from such organizations must be resolved with the seller directly. NRL was responsible for the design, manufacture, integration, and mission execution of the Clementine spacecraft for the Ballistic Missile Defense Organization. During its two-month orbit of the Moon in 1994, Clementine captured 1.8 million images of the Moon's surface. The Laboratory provides the Clementine Lunar Image Browser as a courtesy to scientific researchers, as well as the general public, and you are welcome to browse the over 170,000 images that are available. Below is an image of the moon derived from data accumulated by the Clementine satellite. This interface allows you to view an image of the moon, centered on whatever point you indicate by clicking on the image below. In addition you may select from a variety of resolutions and image sizes. You may also retrieve a copy of the actually data returned by the satellite from which the multi-resolution images are derived by using the form in the bottom section of this page. If you are not using a graphical WWW browser you may download the image for viewing seperately. More information and help is available for this interface.